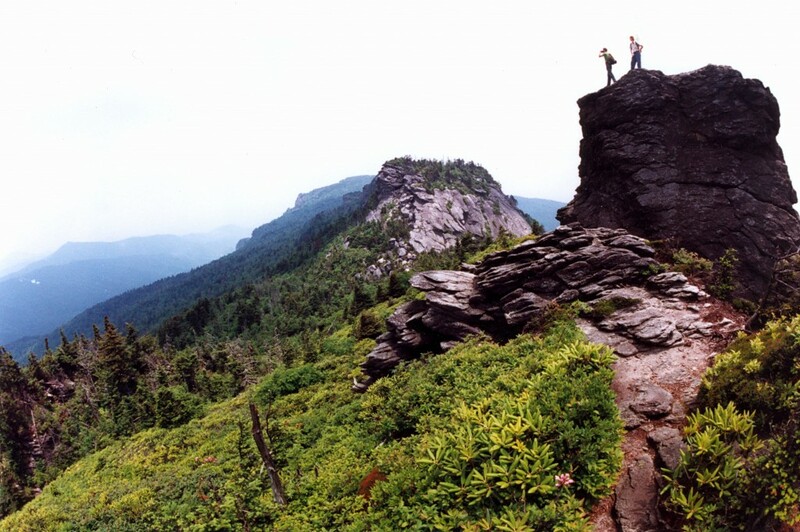 Grandfather Mountain offers everything from beautiful hiking trails to a nature museum, from a breathtaking mile high swinging bridge to a wildlife habitat. Whether you are an experienced hiker, Blue Ridge Mountain lover, or simply looking for a way to spend a Sunday afternoon outside, Grandfather Mountain is the place for you! Grandfather offers 11 hiking trails, all of which are different levels of difficulty. There are rugged trails for the tenured hiker, and there are shorter, more gentle trails for those wishing to venture into the woods without a strenuous trek. The different trails can be accessed by parking lots on the various levels as you drive up the mountain. The Nature Museum houses 2 dozen exhibits on Grandfather Mountain and the surrounding area. Visitors are able to see 62 gems and minerals found in North Carolina up close. Another exhibit showcases the common birds of the state, as well as several other featured animals. The animals featured here are the ones from the Wildlife Habitat which include, the black and brown bears, mountain cougars, river otters, and deer. You will have the opportunity to learn unique facts about each of these animals! For example, who knew that all cougars are born with deep blue eyes and later they turn gold? 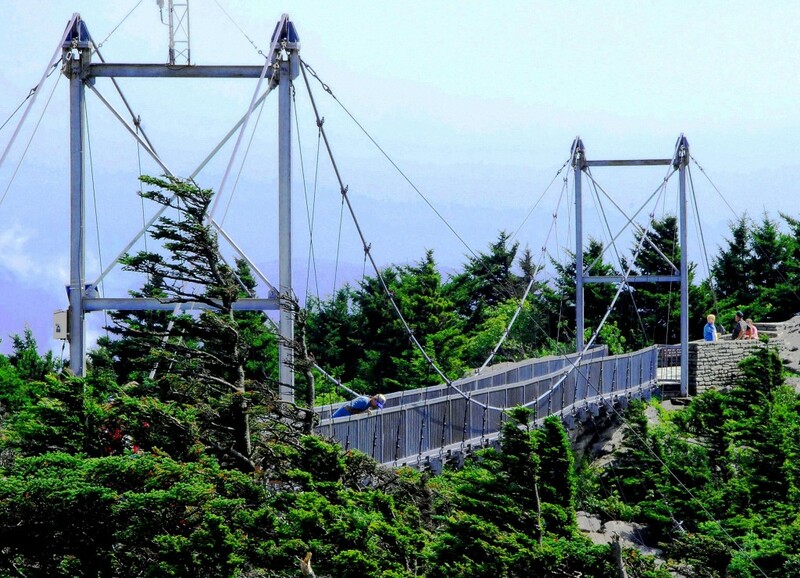 The Mile High Swinging Bridge is truly a mile above sea level! Talk about a view! It has been in place since 1952 and has allowed thousands of visitors the chance to take in breath-taking views. From the bridge you can see the beautiful Blue Ridge Mountains, Sugar Ski Mountain, and on really clear days you can even see the Charlotte, NC skyline! The Wildlife Habitats allow visitors to see animals in their natural habitat. The animals featured here are black and brown bears, mountain cougars, river otters, and the white-tailed deer. Visitors are able to get up close and personal to the animal habitats and take great pictures! On weekends, there are certain times of the day when Naturalists give educational talks at the different exhibits. This gives guests an even closer look at the daily life of the wild animals we do not commonly see. There are lots of great picnic tables and huge rocks to lay a blanket on for a casual picnic lunch. However, if you do not bring your own food, there is a grill next to the Grandfather Mountain Nature Museum. Mildred’s Grill offers burgers, chicken strips, soup, and salads. For all of you with a sweet tooth, be sure to check out The Fudge Shop just around the corner from the museum! Weather- It is typically 8-10 degrees colder at the peak of Grandfather Mountain, than at the base. Dress in Layers!!! Wear comfortable tennis shoes or hiking boots, . Do not wear shoes with a slick bottom, we want you to be safe! Clothing- Again, dress in layers and wear something comfortable! You can do as much walking and hiking as you desire, so you will want to dress appropriately. Bring a Camera!! You will most likely want to take a picture of everything you see! Bring Friends! This is a great outdoor adventure, and is even more exciting when shared with others. Bring a picnic lunch and some snacks for the kids! And extra water- you are most likely going to be walking! Stay hydrated! Stay on the trails and be aware of signs. These are here to keep you safe. If you choose to cross the bridge and continue the trek on the peak of the mountain, be extremely cautious, and keep an extra close eye on the kiddos. We want everyone to be able to visit Grandfather again! Visit either of the Grandfather Mountain Gift Shops and make sure you bring home a little memento of your adventure. They have awesome comfort color t’s, coffee mugs, and personalized magnets. Or, if you’re like me, you will want to have proof you conquered the mountain and the Mile High Bridge by getting a sticker for your car! Tell your friends & come back!! There are very distinct seasons in the mountains of North Carolina and they all have something different to offer. Each trip to Grandfather Mountain will bring new experiences and great memories!